Being rich, we have been told, is a wonderful feeling. Most people automatically find you attractive and there is that refreshing feeling when everyone agrees with anything you say. But also, and perhaps this is the most important thing, you can buy almost anything you set your Gucci-shaded eyes on. Fancy cars, shiny watches, truffled lobster topped with caviar drizzled with gold dust, and a PlayStation 3 per room in your 18-bedroom house by the sea—are all just one swipe away on that credit card with a bottomless credit limit. But then there is, alas, such a thing as too much luxury. A Brioni suit with Zegna footwear is classy. But a bagful of Swarovski, an electric blue stretch limo and a limited edition Swiss watch made entirely of pink diamonds shaped like a cat? You’ve just become an East Coast rapper with his hit No. 1 single, I ain’t got no class dawg! The message is simple: The line between class and bling is thin. We present an illustrated guide—comprising some of the most luxurious and some tasteless products from around the world—to making the right luxury choices when you summon that personal shopper next time. Read on while we draw that line. 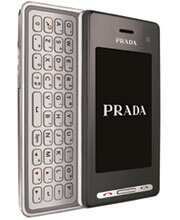 Crude:In July 2006, Russian firm JSC Ancort collaborated with Austrian jeweller Peter Aloisson to produce what is still the most expensive mobile phone in the world. At just $1.3 million (around Rs6.5 crore), the Ancort Diamond Crypto is designed to effortlessly fit into the lifestyle of a Russian oligarch who is so scary that no one tells him his phone makes him look like an idiot. What is the phone made of? Mostly platinum. And some gold. And did we say platinum? Crude: Serendipity 3 is a restaurant on the Upper East Side in New York that owes much of its fame to its Golden Opulence Sundae. At a laughable $1,000, the dessert is the perfect way to end a meal, especially if you can expense it to the office account. 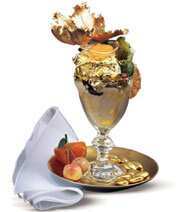 The sundae comprises premium vanilla ice cream, super expensive Amedei Porceleana chocolate and lots and lots of gold. And a little caviar. The guilt pang next morning comes free. Crude: We don’t know where to start with this one. 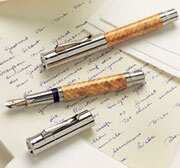 Montblanc is known for making those sober black pens with the little floral caps that look smashing in a smart businessman’s shirt pocket. But when they collaborated with Van Cleef and Arpels, they just let their creative juices go...out of the building. The hideous Limited Edition Mystery Masterpiece comes in nine variations, with a choice of rubies, sapphires or emeralds and 840 diamonds. If you must, you can get one for around $730,000. Crude: Mastercard recently announced the launch of a diamond-studded credit card for its customers in Kazakhstan. We repeat: diamond-studded credit card. “Borat" Sacha Baron Cohen would have loved it. But this was not the first time they made a priceless card. Earlier this year, finance firm Dubai First announced the Royale Mastercard, by invitation only, with a single diamond and gold trim. We would have loved to give more details, but we weren’t invited. 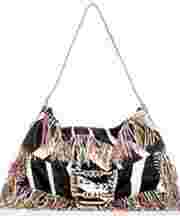 However, there is nothing eccentric about this gorgeous Chanel lambskin purse in iconic black and white. Available now for Rs95,000. Just burn the money and spare yourself the certain and instant ridicule that will follow purchase.